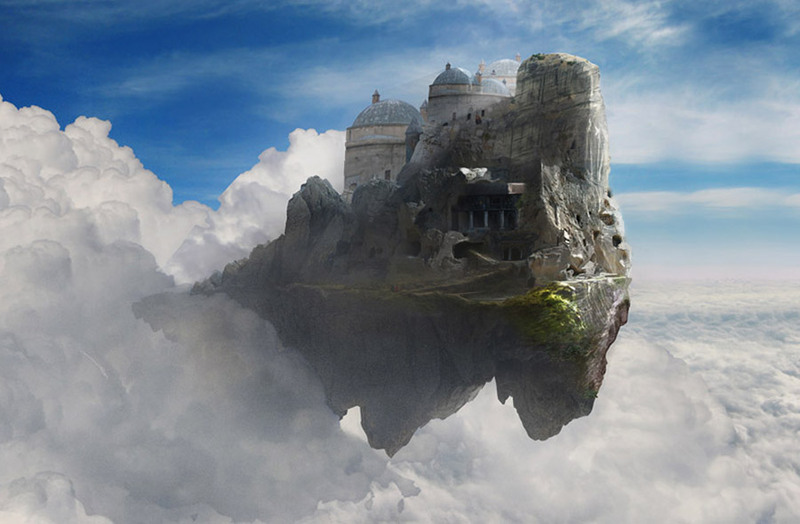 picture depicts the Library as it travels high in the troposphere on its migration from city to city. A vast repository of books, magical and mundane, the floating library is an awe inspiring landmark. It is known to float between cities and is thousands of years old. The frequency with which it changes locales is determined by will of the Library itself. It is said the Pewey Decimal System knows where the library is most needed. The Book Wurms call the library home. Eastern nobles and Samurai especially make pilgrimages to the Floating Library. It is a high traffic location. The Floating Library is anchored in the northern most section of Dragonport. 1-27-2012: The Floating Library is currently in Mechanis where it was banished by the hallows of Ra-men. Presumably, Hiroshi Ohba, Glory Bookheart, and Baltasar Malich are trying to find a way to bring it back. The Knowledge Busters provide a floating disk service which is perfectly safe and fast. Gale Breeze capitalizes on this by offering bungie jumping. People go missing within the walls of the Library. The Library has moved in response to wars….before the wars were declared. It has always sought to be neutral. The Library has moved without all Knowledge Busters on board in the past. The Knowledge Busters don't view this as an abandonment, but as a sign that the Library still needs a presence in that city. "The Floating Library is the soul of Melville Pewey, who has ascended to godhood, but wishes to keep an earthly body. "-this cannot be proven, and even the librarians and Knowledge Busters find it hard to believe. Many Wizards think that the Library attempts to lure in young mages with the promise of cheaply backing up their spellbooks. The wisest wizard realize that this practice gives the library itself access to all wizard spells. Recently, some of the mages in Dragonport have made a run on the Library in order to steal the spellbooks contained within. They failed miserably. It is said the Library stripped them of all magic. 1 Octagon 5 1-27-2012 Banished via The Hallows of Ra-men. Hopefully it will return. 2 Approaching Preponderances 7-10-2012 The party went there for more research. 3 Unveiling the Beyond (part2) 10-26-2012 Mentioned by Alexei Ivanov. 4 Crimson lineage 04/03/2013 Visited briefly by a pair of planar travelers who crash-landed on top of someone resembling Khain Firemane… except with blue instead of 'red' features, be it hair or attire.